Andrew Bisharat, an editor at Rock and Ice, recently sent me a copy of his new book published by The Mountaineers. I promised I would take a good look at it, not least because I am an admirer of his straightforward writing for R&I but also because in an interview with Splitter Choss, he described his view that difficulty is very much a matter of perception. In that interview, he said, "However, I honestly believe that it is realistic for an average person to do 5.13+ or 5.14." This is a great attitude to promote. So the question might be posed; can this book help the average person do 5.13+ or 5.14? Well yes and/or maybe. The book's ambition is to provide a thorough introduction to and explanation of many sport-climbing specific techniques that help a climber get to the essence of sport-climbing's main challenge, solving hard moves and linking sections of routes. Thus he offers a detailed description of stick-clipping, "boinking," etc., all basically modes of aid climbing that help an aspirant climber get acquainted with the features and movements on the route. Not so long ago, these methods were considered to be cheating(?) by many sport climbers. Rightly Bisharat considers those attitudes, which he surveys in a good chapter on the history of the sport, as self-limiting and elitist. Do what it takes is his approach and one I agree with completely. The bolts are there to pull on and fall on and how you choose to do that is up to you. However, the biggest problem with the book for me is the relative lack of attention paid to physical aspects of the sport. There is quite a good chapter, though briefer than it ought to be, titled "What is 'good' technique?". There is relatively little on the physiology of climbing and next to nothing on injury prevention or diet (it's not even in the index). This to me is a mistake as the climber ultimately depends not on stick-clipping or other techniques but on physical strength and ability combined with a keen mental focus. The aspiring "average" climber needs to be able to understand at some point what's under the hood or a lot of wasted time may be spent trying strategies that do not work. 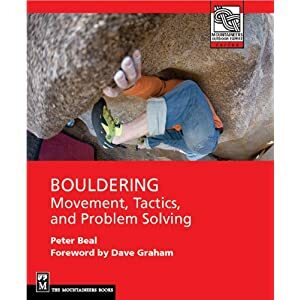 I am surprised that Andrew twice characterizes bouldering as "crushing every hold" and less complex than sport climbing since numerous boulder problems rely on many of the same strategies as sport climbing. In fact a significant opportunity is missed here to emphasize continuities and commonalities instead of differences. Bouldering is simply the easiest way to build the technical prowess and physical strength to succeed on hard sport climbs. I have been able to maintain the stamina to easily onsight mid-to-hard 5.12 in the gym through a steady diet of bouldering, mostly on short boulder problems, the only accessible form of training I have available right now. So is the book good? Absolutely yes. There are far too many good things in the book to begin to list here. The chapters on falling and belaying well are very helpful for example. Even its price is reasonable. Is it a complete guide to success at sport climbing? No, because you will want at some point to explore more deeply the physical and mental sides to the sport that affect movement and technical proficiency. I still have not seen the book that really combines both well. Which leads to another question. Has the era of climbing instruction books begun to wane? Have climbing videos and internet-based information begun to replace not only guidebooks but also climbing instruction books? As a climber who read avidly classics like Royal Robbins' Basic Rockcraft and Advanced Rockcraft, I wonder if something is changing here. Bisharat's contribution is to lay out clearly the technical foundation for getting on harder sport routes, laying out in concrete form the knowledge that you could only obtain previously by hanging out in the Skull Cave or the Arsenal at Rifle (ugh!) along with the other spraylords. I haven't been to Rifle in years but thanks to Andrew, for way less than the cost of a tank of gas, now I can brush up on the beta I need to link up one of the many steep polished monsters that lurk in that dark canyon. Performance Rock Climbing (1993) by Dale Goddard and Udo Neumann remains "the bible" of any climber who wishes to get the most of what their genetic blueprint allows. I don't think the internet is going to be replacing Freedom of the Hills on anybody's shelf anytime soon, but maybe "How to Climb 5.12"? Thanks for the review. I think that books on general climbing instruction are maybe slowing down. At this point I hope that books will start to specialize and focus on distinct topics within climbing. Hopefully there will be more books that limit the scope of their climbing topics and do a better job w/ the material they do address. I agree with chuffer. Would love to see them put out a new revised edition. There's also the recent "Self Coached Climber" which remains somewhat under the radar but is an excellent, current training book. Anonymous November 3 makes a good point. Training content is well-suited to the Internet. Sites like Dave MacLeod's onlineclimbingcoach.blogspot.com are a great source of information with the bonus of being interactive. But titles like Yosemite Climber, Climb!, the new Stonemasters, Freedom of the Hills, definitely deserve to be kept physically in hand.